Everything you’ve heard about Young Life camping is absolutely true. 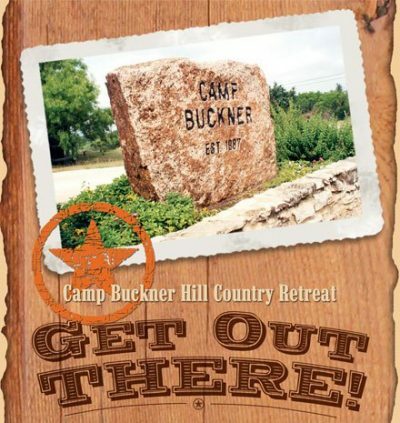 Nestled in Burnet, TX, in the heart of the Texas Hill Country, Camp Buckner Hill Country Retreat provides a peaceful backdrop for your church, youth group or business to grow in their relationship with Christ. The easy-going atmosphere and tranquil setting lend itself to renewal and relaxation, and the state-of-the-art meeting rooms, audio/visual equipment and high-speed internet access accommodate all your business needs. Work or play, you will find Camp Buckner pristine and comfortable, our staff friendly and eager to meet your needs and the peaceful outdoors a welcome diversion. From conference planning to country cooking, we provide climate-controlled lodging, on-site recreational activities and assistance arranging local side trips.